InvestorCentric: Are Obama's Policies Hurting The US Economy? Are Obama's Policies Hurting The US Economy? Maryland Professor Peter Morici writes in The Street that the Obama administration's policies are resulting in fewer dollars in consumer's pockets and more jobs going overseas. Additionally, the allocation of bailout funds was disproportionately spent on large financial institutions, leaving the small business friendly community banks out to dry. See the following post from The Street. Americans have the economy s coped. Polls indicate they sense the economy growing again, but many more believe the job market is getting worse than see it improving. Over the next three years, the economy must create nearly 13 million jobs to bring unemployment down to 5% -- still higher than pre-recession levels. That requires 360,000 jobs every month and economic growth at 5% a year. 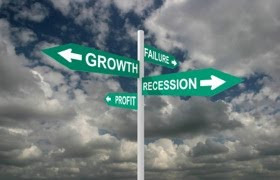 After a deep recession, robust growth is possible if businesses have enough customers and capital, but President Obama's policies don't address the underlying causes of the Great Recession. Neither enough demand, nor financing, is forthcoming. Domestic demand--consumer, business spending, etc--will accelerate to 3.5% a year, but much is tapped off by a rising trade deficit--Chinese imports benefiting from an undervalued yuan and pricey imported oil. Troubles in Greece and elsewhere in Europe dampen markets for U.S. exports. President Obama won't back up talk with China about its protectionism with concrete actions. The Chinese sense in Obama weakness, and in America, decay. The President talks tough on the speaking circuit, but hasn't the stomach to stand up to China any more than he confronted tort lawyers and drug manufacturers in his health care reforms. The BP oil spill is a terrible national tragedy, but the hard reality is costly imported oil is depriving U.S. businesses of customers. Much money that leaves the country to pay for oil doesn't return to buy exports. Obama tongue-lashing Big Oil makes it more unlikely the US will drill a lot more, either offshore or onshore. His bold talk notwithstanding, promises to build out domestic alternatives, like nuclear and wind, are not backed up by the comprehensive actions possible given technologies available right now. The President talks a good game but hardly plays--a fisherman boasting in the tavern who owns no boat. Add the troubles of the 8000 regional banks. Obama spent the TARP to bail out Wall Street banks, GM and his pals at the United Autoworkers, but left the 8000 regional banks to sink or swim. Cash strapped, those banks can't lend enough to small- and medium-sized businesses, which create most new jobs. Add the new health care law--with huge costs to employers and higher premiums for individuals and the cost overruns the Congressional Budget Office now admits. Voilà, even fewer dollars for consumers to spend on U.S. goods and more businesses offshoring jobs. Now Obama wants to jack up taxes--repeal the Bush tax cuts, add a hefty interest and dividend tax, and the mother of all confiscatory taxes, a value added tax. I have an expensive education in economics. Nowhere do the textbooks state raising taxes creates jobs. President Obama reminds me of New York City before Mayor Giuliani. Mayors Koch and Dinkins were always scrounging for new taxes rather than addressing the dysfunctions of a broken government. Democrats assume wealth and tax it to paint over problems. Smart people cultivate wealth knowing tax revenues to solve problems will follow. Professor Peter Morici, of the Robert H. Smith School of Business at the University of Maryland, is a recognized expert on economic policy and international economics. ummm... who let this guy blog? ?